Hi guys! 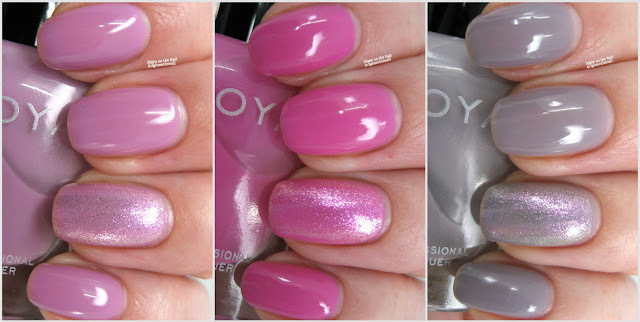 You might be wondering why I have the newest Zoya trio before their holiday Party Girls Collection. Well, it's coming, but midway through swatching it I got a really bad break and had to cut all my nails down. I'm trying to decide whether I want to reswatch the whole collection (12 polishes), or just show them as-is. Any opinions? Please leave a comment to let me know. The Kisses Pastel Jellies set is for sale now and features 3 jellies that are buildable based on the number of coats you use. You can use them on their own, make a jelly sandwich with a glitter polish, or add a shimmer top coat to it. These are available individually for $10, or you can purchase it as a trio ($30) or a quad ($40) with the shimmer topper, Leia. Shall we get a closer look? I'm going to be honest and say that jellies are not my favorite finish. I like opaque colors, so give me a good 2-coater and I'm in heaven. Jellies obviously aren't meant to be worn this way, and you can achieve a sheer look with fewer coats that what I used here. Up first is Libby which is a milky lilac purple. I think Leia really adds a lot of dimension and pairs well with Libby. Make sure to use thinner coats, and I ended up using 3 coats for the photos above. Princess is the most opaque polish of the trio and is a soft pink jelly. Again, Leia looks great with this one. I used 3 coats for the swatches, but you could potentially get away with 2 thicker ones if you have short nails. Oh, and all of these are a breeze to remove as well! Vickie is my favorite color of the trio, but it's also the sheerest. I had to use 4 coats to get mostly full opacity. It leans purple or grey depending on what you put next to it. I didn't find it to work well with Leia...it doesn't clash, but I don't think I would wear it like that again. There you have it, what do you think of these jellies? Are you a fan of the finish? My top picks are Vickie and Princess. Zoya polishes retail for $10 and you can find out more about them on their website, Facebook, Twitter, or Instagram pages. Keep an eye out for them in your local Ulta store if you want to see the bottles in person before you buy. Will you be purchasing it? 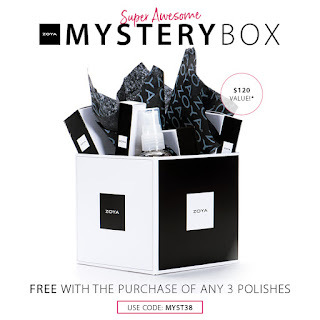 You can buy the trio and get the mystery box for free!